Make your day even more memorable with the enchanting music that has soothed souls for over 500 years. Imagine the gentle strains of a lute accompanying you as you float down the aisle. If you're looking to create a peaceful, subtle and very romantic atmosphere for your ceremony, explore our web site, listen to a few sound clips from our twelve CDS, check out our YouTube videos, and read what the reviewers have said. Then get in touch. 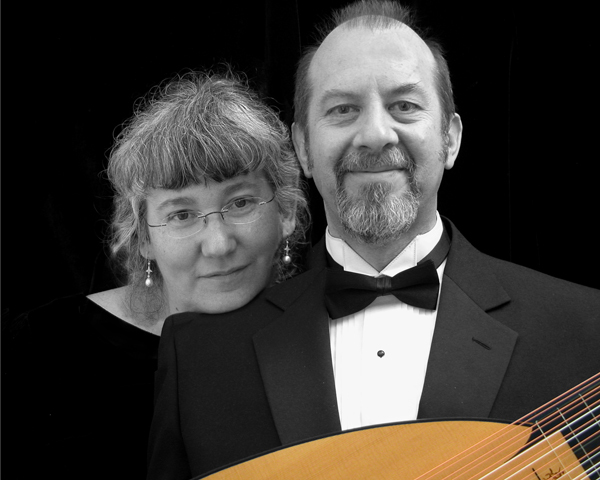 Ron and Donna are available as a lute and voice duo, or Ron can play alone...with one of the most beautiful instruments you and your guests are ever likely to see. We're professional musicians - reliable, low-maintenance folks who will stay in the background and add a calming influence to the surroundings. No amplifiers or microphones to clutter your photos; all we need is a music stand and a couple of chairs. Every Renaissance monarch and aristocrat had his personal lutenist, and when you hear the sound, you'll understand why. Let us help you create an unforgettable day! Mignarda, based in rural upstate New York, is available for weddings, concerts, house concerts, lecture-recitals, or in a format tailored to meet your needs. We travel regularly all over the U.S. so don't hesitate to get in touch and let us know what you have in mind. For rates & terms, please email us at lutesongs [at] mignarda [dot] com, or use our contact form. "Such a lovely instrument, and so beautifully suited to Donna's smoked-cream mezzo"
"Donna's exquisite, unpretentious voice and your subtle accompaniment. What a perfect combination! Long may you guys thrive!" "The lovely open quality of Donna's voice I find really endearing, and so suitable for giving us the 'inner passion' of these marvellous texts." "Laden with elegance...an adventure in sound made all the more bewitching through the talents of Renaissance past-master Andrico and enchantress Stewart."